It hopes to be the Island Records of augmented reality. Everyone has an opinion about Magic Leap. It's either a revolutionary augmented reality company that could change the face of entertainment, or it's emblematic of everything wrong with the technology industry -- an over-hyped, multi-billion dollar pipe dream. Last week, we saw the first impressions of the company's long-awaited headset, which splashed a bit of reality on the company's hype cycle. But that's not necessarily a bad thing. Now that we have a better sense of what Magic Leap's $2,295 hardware is capable of, we can take a step back and consider what the company is actually trying to accomplish. In a brief demonstration, I found the Magic Leap One headset much lighter than I expected, even though it looks like a pair of '80s sci-fi goggles. It comes with a wide variety of nose pads to ensure a snug fit. If you're in an area where you can buy the headset, it'll be delivered by a worker from the startup Enjoy, who will help you set everything up and make sure it fits properly. Putting on the Magic Leap One involves pulling back back the head strap, lowering it over your head, and then pushing the rear strap in a bit to tighten it. There are no dials or velcro strips to deal with. The headset is connected to a small, Discman-shaped Lightpack, which houses all of its computing power. It's not very heavy, and it clipped onto my jean pocket easily, but you'll have to deal with a wire while using the Magic Leap One. Thankfully, it wasn't nearly as distracting as a VR headset connected to a PC. The company's motion controller feels like a larger version of the Gear VR's Touchpad -- it rested in my hand easily, and the thumb and trackpads were easily within reach. Tonandi, the Sigur Ros experience I was testing, relied entirely on hand gestures, so unfortunately I didn't get to try out the controller properly. When I donned the Magic Leap One, I watched as the floors and walls of a meeting room were painted with virtual vegetation and floating animals, swimming all around me. Even though I couldn't wear my glasses with the headset (prescription Magic Leap lenses are coming soon), everything looked clear and detailed when I leaned in close. The AR environment looked sharper than anything I've seen on HoloLens or Meta's headset. And while the field of view could be better, it was significantly taller than the HoloLens, and a bit wider. That made Tonandi feel more immersive than Microsoft's experiences. Groundbreaking hardware alone won't make Magic Leap a success. As with any new platform, software and a breadth of experiences will make or break it. That's what Rio Caraeff, Magic Leap's chief content officer, has dedicated the past few years of his life to. After serving as Vevo's founding CEO, he joined Magic Leap in 2015 to help spin up the company's media engine. And he's just getting started. "I joined Magic Leap really because I saw the dawn of a new wave of computing that was in front of us," Caraeff told Engadget. "That doesn't come along very often. The cycles are compressing, but it doesn't come around every year or two. And I saw an opportunity to be a part of something new and to bring my experience with storytellers, with creators, with developers, with content creators, and really bring that to this medium. Because it's really, it's the perfect marriage of the intimacy of who I am as a person with the power of enabling technology." As he describes it, Magic Leap is "really about amplifying who you are, human-centric computing, spatial computing." The goal is to move us away from staring at screens and give us ways to reconnect with the physical world (something we heard Google touting with its ill-fated Glass). "It's about making you proud to be who you are, but all of a sudden you have super powers, all of a sudden you have X-ray vision, all of a sudden you have new capabilities that allow you to be more who you are, where you are and when you are," he said. If Magic Leap was a movement, talking to Caraeff was like talking to a true believer, someone who has faith that his company can change the world. His "baptism" was a demo in 2015, where a flying robot landed on his hand, followed his eyes, and flew away when he moved. It was an intimate moment — he didn't want to hurt the virtual creature, instead he wanted to be closer to it. And Caraeff recognized immediately that sort of connection between the physical and digital world was something we've never seen before, and the next stage of how we'd all interact with computers. So how do you build a content ecosystem that supports this grand, borderline religious vision of what Magic Leap can be? Caraeff believes it starts with the company being "accountable for its destiny." That means it can't just focus on hardware, it also needs to build the software to bring out the technology's full potential, as well as the content to entice people into augmented reality. "We wanted to focus on essentially a full-stack approach," he said. " Everything from optics, to hardware, to sensors, to the operating system, to developer tools, to developing environments, to leading examples of what you can do with this new medium. Because ultimately if we're not going to take responsibility for it, if we're not gonna be accountable for it, then who will?" This line of thinking should sound familiar if you've been following the virtual reality industry. Both Oculus and HTC Vive realized they needed to build a strong software and content ecosystem around their headsets. Two years after the launch of the Oculus Rift and HTC Vive, we're still waiting for the single "killer app" that would entice mainstream viewers. Meanwhile, Sony's PlayStation VR, which is less technically advanced and is powered by a game console, instead of a high-end PC, has been a hit with shoppers, thanks to a steady supply of impressive games and experiences. 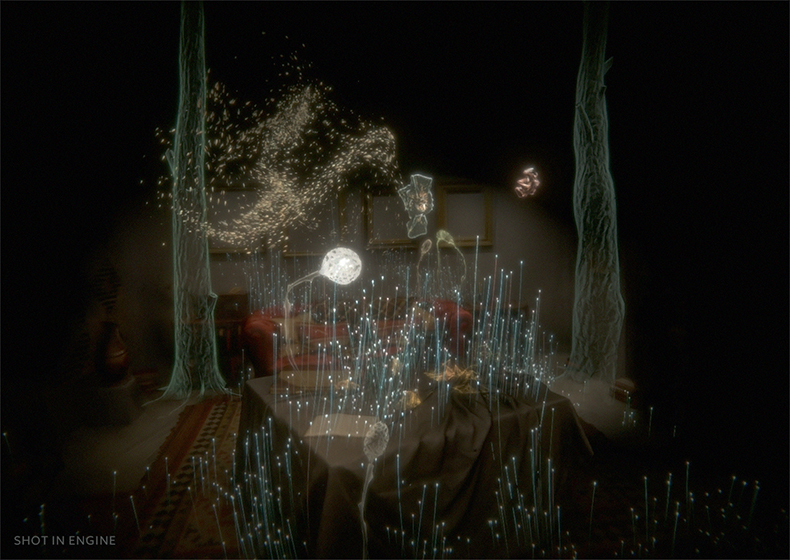 Magic Leap's Tonandi experience with Sigur Ros. Much like Oculus, Magic Leap launched an internal studio to build experiences for its AR goggles, with a focus on exploring how they could be used for entirely new forms of storytelling. The group worked closely together with Magic Leap's hardware and software designers — that includes everyone from low-level systems engineers to people working on AI, animation and sound design. Alongside the development of its debut glasses, Magic Leap developed Create, which allows you to build augmented reality characters and environments easily, as well as Tonandi. That experience could end up being one of the best ways to show off Magic Leap's potential. When I touched the grass or passed my hands through a flock of pixelated songbirds, I heard atmospheric Sigur Ros samples, including lead singer Jonsi's melodic vocals. Tonandi isn't really a game -- it's more like stepping into the collective mind of the Icelandic group. And it's something you can't replicate with an AR phone app, or even virtual reality. What makes it work is seeing the real world covered in digital creations. 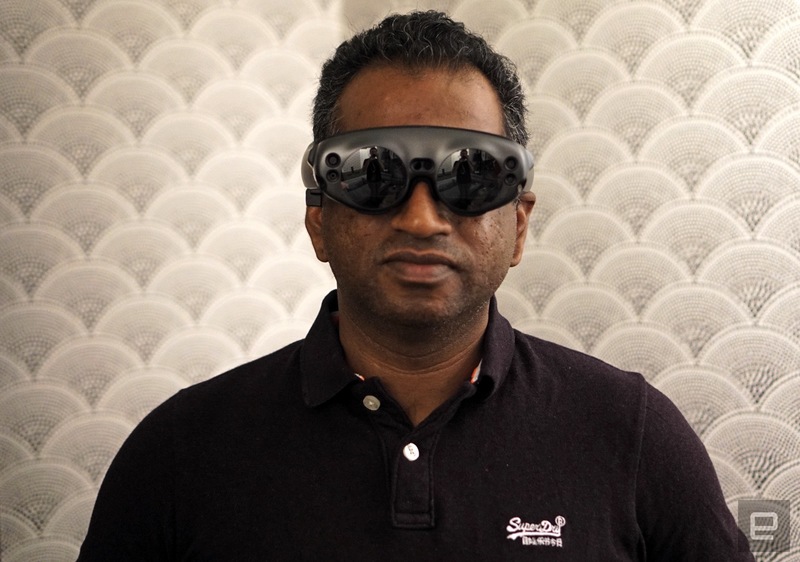 Based on my time with it, I could see myself using Magic Leap more than I do VR headsets. It helps that you're not locked out from the world, and the entire experience feels less confining. In addition to its own work, Magic Leap also sought out developer missionaries — people who believed that AR was the next stage of computing (and who didn't mind working with new technology before its fully polished). The company launched its first developer program in July of 2017, and since then it's provided hardware to hundreds of creators across industries like architecture, medical imaging, healthcare, government and, of course, gaming. He was surprised to see some large companies come aboard, as well — both the NBA and the New York Times have AR apps available at launch. And on top of all of that, the company has teamed up with notable creatives like sci-fi author Neal Stephenson, who serves as its "chief futurist," and Steven Spielberg. "We're trying to build a unique place," Caraeff said. Some companies focus entirely on technology and efficiency, with the hopes of scaling as much as possible, he noted. And on the other end of the spectrum are companies focused on nurturing artists and creativity. "We're trying to build a unique company that really is creator first, developer first, really trying to be more like the earlier warmth and intimacy of artistry companies." When Caraeff first joined the company, founder and CEO Rony Abovitz said he wanted Magic Leap to be like the legendary independent label Island Records in the late '70s and early '80s, when it featured the likes of Bob Marley and U2. Abovitz wants the company to nurture relationships with artists and creators in a similar way — Caraeff's challenge is to do so while juggling everything else Magic Leap needs to do as a technology company. He acknowledges that normal consumers don't care as much about technology as they do about the TV show or movie they're watching. By working with artists, Magic Leap wants to constantly remind itself of that truth. Looking ahead, Magic Leap plans to have its developer and creator conference in Los Angeles on October 9th and 10th. It'll be the first chance for the company to truly gather its community together. In addition to going over every aspect of their technology, Magic Leap also plans to highlight its existing developers and partners. In particular, that includes its relationship with Unity and Fortnite creator Epic, whose 3D engines are used to build AR experiences. As with most developer conferences, there will be a keynote (that's also live-streamed to the public) and a combination of technical and experiential sessions. The company plans to open registration for the conference soon. "[Magic Leap One] is not the kind of product that everybody on the planet knows what it is, or why they need it, and so it's very hard to just kind of put it on the shelf at the store and hope people buy it," Caraeff said. "What matters is you gotta get people to try it. Once people try it, they say, "Ah, I understand what this is, I can see this now."